It was such a blessing to attend the American Christian Fiction Writers conference this year as a soon-to-be published author for Zondervan. Because of this, I was able to attend some of the advanced writing workshops, which will assist my continued learning of the craft. One fun aspect of this year's conference was meeting my agent, Rachelle Gardner from WordServe Literary, face-to-face and getting to know her. This was really nice, and we had some enjoyable talks. Another highlight was visiting my editor from Zondervan, Sue Brower. 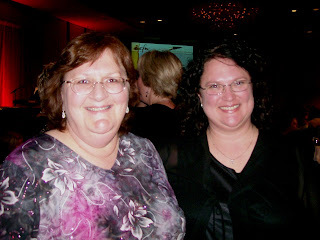 She invited all of the Zondervan authors in attendance to dinner Friday night, which was really fun . . . and intimidating . . . but mostly fun! We were picked up at the hotel and then taken to Kincaid's Steak House where we visited and laughed and ate a wonderful dinner. In my humble opinion, the bread and desserts were the best, but it's just hard to beat homegrown Kansas beef. Although I wasn't able to sign a book at the Mall of America, I cheered my support to many of my writer friends who I only see once a year at this conference. It was such a joy to attend, and I look forward to signing my debut book, Snow Melts in Spring, next year in Denver! Me and Camy Tang at the book table. Beth Goddard signing her debut book. Judith Miller waiting to speak at the open forum. Tamera Alexander looking ever so pretty. Kim Vogel Sawyer posing with her "lead" man. Deborah Raney & myself at the Saturday night banquet. Next year's conference is scheduled for September 17-20 in Denver with Keynote Speaker Debbie Macomber.